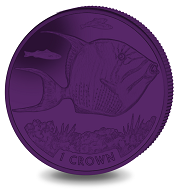 February 7, 2019 – The unique coloured Titanium coins are proving as popular as ever and Pobjoy Mint has announced the release of the second Titanium coin from Ascension Island which features the majestic Queen Triggerfish. 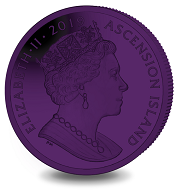 Ascension Island / 1 crown / purple titanium / 28.28 g / 36.1 mm / Mintage: 7,500. The Queen Triggerfish (Balistes vetula) is a reef dwelling triggerfish found in the Atlantic Ocean. In the eastern Atlantic it is found at Ascension, Cape Verde and Azores. The large oval-shaped fish is so named due to its unique spines on its anterior dorsal fins which are used to lock the fish into a crevice during the night. The first spine locks and the second spine unlocks, like a trigger. This prevents predators from pulling them free or swallowing the fish. Ascension Island / 1 crown / unc. cupro nickel / 28.28 g / 38.6 mm / Mintage: 10,000. The Queen Triggerfish also has special membranes which are used to produce a throbbing sound which warns other fish to stay away. The species is generally shy and will move away from divers if followed. However, during breeding season, they will aggressively defend their nests and they can inflict a nasty bite as they have strong jaws with strong incisor-like specialised teeth which are used to chisel holes into the hard shells of their prey. 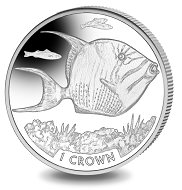 The design on this beautiful new coin shows a Queen Triggerfish swimming above a coral reef. 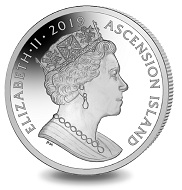 The obverse of the coin features the exclusive Pobjoy Mint Effigy of Her Majesty Queen Elizabeth II. The coin is available in coloured Purple Titanium and also in Unc. Cupro Nickel. Titanium reacts differently with every strike, so each Titanium Queen Triggerfish coin is technically different and varies slightly in colour. There is also a lined effect that is present on the coins which is unique to this metal. More information about this coin is available on the British Pobjoy Mint website. To learn more about the Queen Triggerfish, visit the Wildscreen Arkive website.